Following the initial sightings of Hinde’s Babblers at the University of Nairobi’s Upper Kabete Field Station on 26th February (Simon Carter and David Guarnieri) and 8th March 2017 (Nature Kenya Wednesday Morning Bird Walk), marking the first official records of the species in Nairobi, I have been monitoring the birds as I am a student at UoN Upper Kabete Campus. On one occasion while observing the birds with Allan Kipruto (a schoolmate), we got a brief glimpse of what seemed to be a very orange-looking individual in the bushes where the rest of the Babblers (4 adults) were noisily moving around. We suspected it was a juvenile but couldn’t confirm since it quickly went deep into the bush and did not re-emerge. About 2 weeks later on June 12th, this time on my own, I once again saw this orange-ish babbler in amongst the more regular-looking babblers. Luckily this time I had a camera and quickly snapped a couple of photos before the strange bird dove back into the bush. On taking a closer look at the photos, I was amazed to see that it was indeed a juvenile Hinde’s Babbler! 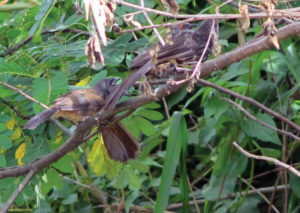 Its head and tail had the same dark grey colour of the adults but it lacked the typical ‘scaling’ patterns and it was orange/rufous on nearly the rest of its body. Its eyes were dark (unlike the red of the adults) and it had a clear yellow gape, a sure sign of its youth. This marks the first ever breeding record of Hinde’s Babbler in Nairobi and the first ever record of a Kenyan endemic bird species breeding in Nairobi. Birds continue to surprise us every day and this unpredictability is what to me keeps bird watching so interesting. The Taita Hills in south-eastern Kenya (3º20’S, 38º20’E) rise abruptly to peaks ove 2,000 metres above the semi-arid plains of Tsavo. The hills contain some of the highest levels of endemism in the world, forming a key part of the Eastern Afromontane Biodiversity Hotspot. They also serve as a catchment for the expansive Tsavo ecosystem. 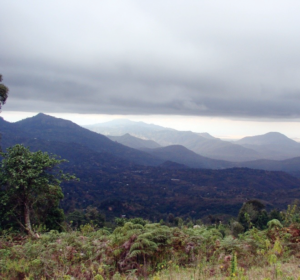 Taita Hills also form the northernmost extreme of the Eastern Arc, a chain of forested mountains extending from Kenya to southern Tanzania. Taita Hills forests Important Bird and Biodiversity Area (IBA) are part of BirdLife International’s Tanzania-Malawi Endemic Bird Area. The hills harbor the montane cloud forest whose vegetation is much influenced by both Eastern Arc and Kenyan highlands. Despite losing about 98% of forest cover in the last 200 years, the remaining Taita Hills forest fragments continue to support a high number of endemics and unique flora and fauna, including Kenya’s most threatened birds: the Critically Endangered Taita Apalis and Taita Thrush. Other endemics include: the Taita Hills Purple-glossed Snake, the Sagalla Caecilian, the Taita Warty Frog, the Taita Blade-horned Chameleon and three endemic butterflies. The flora is also rich and full of endemism in these small and extremely fragmented forests, where more than 13 plant species endemic to Taita Hills occur. The hills are also home to the Vulnerable Taita Falcon and Abbott’s Starling, the Endangered Taita White-eye and the Near Threatened Southern Banded Snake-eagle. Dawida Biodiversity Conservation group (DABICO) is the Taita Hills IBA site support group. The group has 13 constituent groups and is involved in activities such as establishment of tree nurseries, beekeeping, handicraft, eco-tourism and butterfly farming. DABICO manages the Ngangao Forest community resource centre that was built through collaboration with Nature Kenya, the Taita Taveta Wildlife Forum and the Community Development Trust Fund. The resource centre offers environmental education to school children and is also a camping site for visitors. Nature Kenya in partnership with DOF – the BirdLife Partner in Denmark, through funding from the Danish International Development Agency (DANIDA) through CISU (Civil Society in Development), has been running the “Integrating Livelihoods and Conservation – People Partner with Nature for Sustainable Living” program in Taita. The long term objective of the Program is to: reduce the destruction of forested IBAs and contribute to the realization of best participatory forest management practices for the benefit of all. To achieve the objective, the program is supporting the formation of two Community Forest Associations (CFAs) which is still ongoing. The program is also supporting groups engaged in livelihood activities such as beekeeping, fish farming, tree nursery, handicraft and butterfly farming. Firewood and charcoal are considered the two main sources of cooking fuel in most rural and urban areas in Kenya. Statistics from the Ministry of Energy indicate that more than 90 per cent of rural households use firewood for cooking and heating, while more than 80 per cent of urban households use charcoal. It is therefore not surprising that this demand for fuel wood is the one of the major drivers of deforestation in Kenya. As a result, forests and woodlands are rapidly being degraded, while biodiversity is seriously depleted and basic ecosystem services are being negatively affected particularly in areas with no formal protection such as Dakatcha Woodland and Taita Hills forests Important Bird and Biodiversity Areas (IBAs). Arabuko-Sokoke Forest IBA is another coastal forest that is under serious threat though it enjoys protected status. The school feeding program initiated by national government as part of ensuring increased student enrolment and retention is one factor that is silently contributing to deforestation in rural areas. Given that most schools do not have woodlots to sustain their feeding programs or the capacity to purchase firewood, pressure is transferred to surrounding natural habitats. Left with few options, students are asked to bring to school sizeable pieces of firewood every day. In some schools, parents are required to supply firewood at the beginning of the term as part of their contribution to their children’s education. A new conservation intervention may now offer a glimmer of hope for affected coastal forests, however. The adoption of “energy saving stoves”, which burn firewood more efficiently than traditional open fire of a three-stone stove, is taking shape in these areas. As an entry avenue in forest conservation, this initiative seeks to change community behavior and attitudes towards conservation through schools located adjacent to these forests. The installation of school energy saving stoves in Taita, Dakatcha and Arabuko-Sokoke is being undertaken through the “Integrating Livelihoods and Conservation - People Partner with Nature for Sustainable Living” program. The program aims at enhancing participatory forest management and contributing towards improving livelihoods of the community in order to reduce pressure on forested IBAs. The program is being undertaken by Nature Kenya in partnership with DOF – the BirdLife Partner in Denmark with funding from the Danish International Development Agency (DANIDA) through CISU (Civil Society in Development). 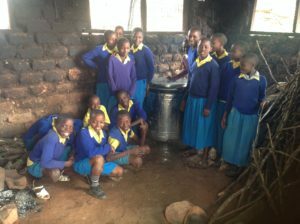 To date, three schools in Taita (All Saints Murughua, Vichwala and Mazola primary schools) have been installed with the energy saving stoves. Over 30 households have also been installed with the home version of the stoves. On average a typical school has 400 students. If each student brings to school a piece of firewood weighing 2kg every school day this equates to 800kg of fuel wood brought to school daily. A school term runs for an average of 70 days. This translates to 56,000kg (56 tons) of fuel wood in use per term and 168 tons per year. According to a paper titled Wood to Energy: Sources and Supply by Langholtz et. al., an acre of pine plantation can produce three dry tons of fuel wood. Using this as the baseline, a school consuming 168 tons of fuel wood clears about 56 acres of forest or woodland annually. These 168 tons of dry wood are equivalent to 75,600kg of Carbon with a storage capacity of 98,823kg of Carbon Dioxide. The “energy saving stoves” intervention seeks to significantly reduce fuel wood consumption by schools as a means of protecting forests. And the stoves are indeed living up to expectations. Tests conducted in Taita to determine their efficacy in reducing fuel wood consumption have yielded positive results. Water boiling tests were carried out in nine schools to establish the amount of firewood and cooking time consumed by the improved stoves and the traditional ones. Results from the test showed that the energy saving stoves consumed over 60% less firewood compared to the traditional open fire stoves. Whereas open fire stoves used approximately 15kg of fuel wood to bring 30 liters of water to boil, the energy saving stoves only used 5kg! The energy saving stoves also took a shorter time to bring the water to boil, and produced less smoke. The ongoing installation of energy saving stoves at the three sites is expected to benefit 15 schools by the end of 2017 and up to 3,000 households. It is hoped that use of these energy saving stoves will at least reduce pressure on Kenya’s shrinking coastal forests.